Glass tanks were standard until the introduction of acrylic aquariums for sale. The choice to use this material offers customers quite a number of benefits. First, they weigh a lot less. A glass tank, particularly a large one, weighs considerably more than an acrylic aquarium of the same dimensions. The reduced weight makes moving the tank easier and also makes finding a stand that can withstand the weight easier. Another concern for an aquarium fish tank is leaking. No one wants a tank that will end up dripping water all over their home. Because of the way glass tanks are constructed, they are more likely to leak than the acrylic aquariums for sale. Another consideration is the durability of the acrylic. Although actually breaking an acrylic tank is more difficult than breaking one made from glass, the acrylic can be scratched fairly easily. In fact, many of these tanks are scratched up just during the shipping process. Also, over time the clarity of the acrylic may be reduced by yellowing – something that won’t happen with glass tanks. Both acrylic and glass tanks will work well with freshwater and saltwater aquarium supplies. However, if you’re looking for a unique shape for your aquarium, you’ll be better off going with acrylic because it is a more flexible material. Cost may also be an important factor. 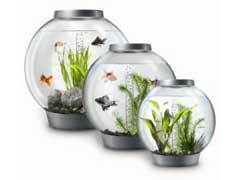 The price of glass tanks is usually less than that for the acrylic aquariums for sale. That means you can spend more on fish tank decorations and, of course, fish for your aquarium. The final decision regarding whether to choose one of the acrylic aquariums for sale or not depends on your budget and the size and shape of the aquarium you want.